The following article first appeared in "The Low Down to Hull and Back News" in the September 01, 2010 issue. Reprinted with permission. Three crammed scrapbooks tell the story of seed swaps and garden tours. Now stored at the historical society archives, the photos document the Gatineau Valley Gardeners' jam-packed 25-year history. Members celebrated the milestone this August in the gardens at Shirley Brown's waterfront home in Larrimac. Some celebrants arrived by boat, their landing enthusiastically cheered by those on shore. Over the years, members have been instructed on gardening technique and design, in a fun and relaxed atmosphere. The club was never viewed as a competitive horticultural society. Although membership numbers have fluctuated, the GVG has never been at risk of withering away. Its $15 annual membership fee is a bargain and when members achieve the ripe age of 80, it's free. 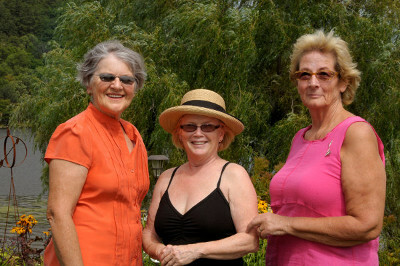 Three of the Gatineau Valley Gardeners founding members (left to right): Diane Renaud, Shirley Brown, and Maggi Williams. Photo courtesy Adrienne Herron. The idea for a club was seeded by Burnett resident Diane Renaud, a former instructor of gardening courses in Chelsea. After being regularly quizzed by participants, she called friends and neighbours to gauge interest in a local gardening club. The first information meeting was held in August 1985, and a show of hands confirmed the name Gatineau Valley Gardeners. A onetime garden columnist for the Low Down, Anne Ginns of Cantley, spoke at its first official event. Besides Diane Renaud, other founding members still actively involved are Jan Gray, Maggi Williams, and Shirley Brown. Other GVG leaders include Adrienne Herron, who not only designed the club's current logo, but was president from 1991 to 1997. Marilyn Liddiard, the editor of the GVG newsletter since 1991, has been called the glue and the conscience of the club. Anne Ginns and Jim Douglas acted as speakers, consultants, and guides. A popular event is the annual general meeting, held in an area garden in May. The main attraction is the plant swap, controlled from overzealous plant-seekers by a ticket allotment system. Memorable tours have included the Montreal Botanical Gardens, the Royal Ottawa Golf Club, and Rideau Hall. Private gardens have been opened to members in Ottawa, as well as in La Peche, Cantley and Chelsea. GVG workshops have covered topics as diverse as naturescaping with native plants, holiday door decoration, or gardening with grasses. Guest speakers have ranged from Ed Lawrence, once chief horticulturist at Rideau Hall, to Trevor Cole, foriner curator at the Experimental Farm Arboretum. 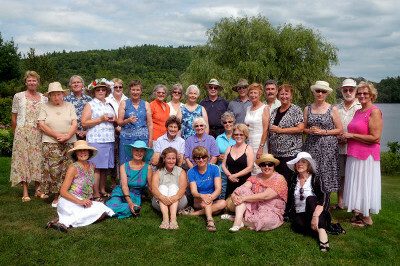 Gatineau Valley Gardeners reunion. Photo courtesy Adrienne Herron. In the early 1990s, the Floral Dog Show helped to counter the competitive nature of gardening. Entrants vied to win in categories such as "the most neglected houseplant" or "the most impossible combination of flowers and vase" (for the colour blind). Celebrity judges were introduced as her worship, Mayoress Judith Grant and Harold (Harky) Milks, renowned for spotting defects and disfigurations. Anne Ginns was quoted as saying, "I especially recall one entry, a low-cut black bra, each cup holding a fully-ripened rosy tomato. So terribly sexist, so politically incorrect, so lovely to see the expresssion on Harky's face!" In 1995, the GVG and the Gatineau Valley Historical Society collaborated on a presentation featuring garden plants popular with early settlers. Many of these plants still grow in historic gardens at the Mackenzie King Estate, or on private properties. That same year, the club marked its 10th anniversary with strawberry social, held in Diane Cofsky's garden in Chelsea. Many wore stunning, white summer dresses, complemented by colourfull hats of unique floral design, to make it an unforgettable event. The contributions of the club to area communities over the years are too numerous to list fully. Members have planted an old-fashioned garden at MacLaren House in Wakefield and helped develop a perennial garden at QUAIL House. Early on, they acted judges for the now-defunct Chelsea garden contest and annually plant and maintain the flower urns at the Pioneer Cemetery in Chelsea. The labours of those committed founding members continue to bear fruit as the Gatineau Valley Gardeners reach maturity. For more information on the GVG, email paulinemyre@videotron.ca or phone 819-827-5849.